Ian Scott (aka "Scotty") is "The Motorcycle Man" himself, a qualified engineer and mechanic. He started the business in 2013, carrying out motorcycle servicing, repairs, rebuilds and MOTs, and the business has continued going from strength to strength since then. Ian has an HND qualification in mechanical engineering and first started working with motorcycles in 1975. He has particular expertise in classic British bikes and Hinckley Triumphs and a wealth of expertise with all makes and models of motorcycle generally. 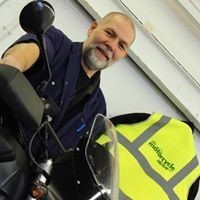 With over 35 years in the motorcycle industry he has a wealth of knowledge and experience and a well-founded reputation amongst his customers, a number of whom travel from outside the county to bring their motorcycles to the man they know they can trust. Ian has trained and worked on a range of motorcycles and at main dealerships including: J S Gedge, St Leonards-on-Sea (Triumph, Honda, Suzuki, Yamaha, Kawasaki, Laverda, Piaggio) and Destination Triumph, Washington (Triumph). During that time, Ian also trained and became a registered installer for Datatool Alarm systems. Ian subsequently worked at Phoenix Motorcycles, Bexhill-on-Sea before setting up his own workshop. He has held a motorcycle MOT Class 1 & 2 test card, carrying out motorcycle MOTs in his own right, since 2001. Working with Ian is Paul Wilson, who joined The Motorcycle Man Limited in 2017. Paul has been working professionally with motorcycles since 1984 and over the years has worked in various mechanical capacities including Phase 1 World Endurance Championships, British Road Racing Championships and youth motocross. He has a particular interest in and passion for 2-strokes, classic Vespas and Hondas and is proud of the fact that his daily (and only) transport is a motorcycle. Susan Scott was involved with setting up the business in 2013. Initially working part-time, she is now at the workshop full-time, helping with reception, workshop bookings and general administration.